The coastal part of the route has two options of 3 days walking (4 nights) and 4 days walking (5 nights). With some great walking along beaches, through salt marshes and nature reserves, this is a great walk for nature lovers. An easy to follow path interspersed with quaint fishing villages and seaside towns with stalls selling fresh seafood along the way. If you have the time available it is worth choosing this option, the low mileage each day allows you plenty of time to look around the towns, beautiful beaches and nature reserves along this spectacular coast. You can walk to Holme-next-the-Sea underneath or over the top of the cliffs depending on the tide, When the tide is out it is well worth taking the beach route to admire the beautifully coloured cliffs. 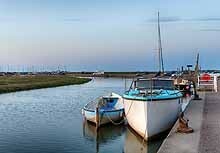 The village of Thornham offers a pleasant lunch stop with some historic pubs. The path continues along marshland and intertidal mudflats with plenty of birdlife, you will also pass some fishing shacks where you can buy freshly dressed crab, whelks and cockles. You will then continue towards Scolt Head through the dunes and marshes and finally on to Burnham Overy Staithe. Maps 2 Ordnance Survey Landranger (1:50000) maps covering the entire route. By Air: The international airports with best connections to the trail are Stansted or Heathrow. From Stansted it is 2 hrs travel time (change at Cambridge) from Heathrow it is 3 hours travel time. Train to Kings Lynn, then bus to Hunstanton (travel time 0.45 hrs, busses every half hour). By Road: From the south M11, A11, Newmarket Bypass/A14 and A10 to A149 for Hunstanton. From the north: A1 to Newark -on-Trent, then A17 Kings Lynn turn onto A149 for Hunstanton.